Manta Rays are threatened by both by-catch and targeted fishing. Due to their foward swimming motion and large body size, they often are tangled in nets and fishing lines and accidentally caught. 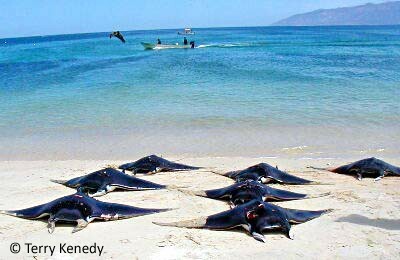 In some areas of the world, manta rays are targeted for food. Although they are not considered a desirable food source for most, as common food fish populations are decreasing worldwide, fisheries are looking for new sources of meat to sell and eat. 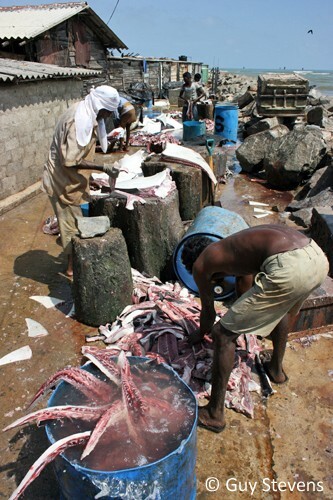 Like sharks, manta ray fins are cut and sold for fin soup, to be made into leather or to be sold in medicinal form. Their gills are also considered highly valuable, as the gill plates can be dried and used in Chinese medicine. The demand for these products have caused local fisherman in poorer nations to target mantas in the hopes of making profits from China’s demand. Why Shouldn't We Kill Mantas? Fishing has long been a vital means for millions of people around the world to eat, make money and celebrate their culture. However, Manta Rays, like sharks, are slow to reach reproductive age. This means that they begin to reproduce later than other fish, and their litter sizes are generally small (1 or 2 babies). They also have a long gestation period (over a year). This means that when mantas are overfished, they cannot replenish their populations at the rate they are being killed, resulting in a steady decline in populations. Mantas are an important part of the marine food web, and without them, their ecosystems are thrown off-balance. What Can We Do To Help Mantas? There is much that can be done to help Mantas! Please visit our “Get Involved” section to learn about all the ways you can save the mantas!